Pimlico Race Track is a relic, but for now it still serves as a stopping point for any horse looking to win a Triple Crown. BALTIMORE – Sometimes an event is so intertwined with its location that they become inseparable. I first came to Pimlico Race Track 15 years ago to cover the 2002 Preakness, in which War Emblem, who had stolen the Kentucky Derby on the front (the last horse to get away with that), would try to tack on another win. (He did; the Belmont three weeks later was another story altogether). My natural inclination as a sportswriter had always been to romanticize the stadiums, arenas and racetracks that I had witnessed from afar as a younger man. The first time I covered a game at Notre Dame Stadium, I had some difficulty paying attention because of the surroundings, after all those Sunday mornings I had spent watching highlights and worshiping golden helmets. (This first visit occurred at age 32, so it’s somewhat embarrassing). By the time I first walked into Pimlico, I had been writing occasionally about horse racing for more than two decades and following the sport (along with all the other sports) for much longer. I remembered Secretariat’s move on the first turn in ‘73. I remembered watching Sunday Silence outduel Easy Goer in 1989 (I was sitting in a hotel room for that one, on a rest day between NBA playoff games). In my imagination, Pimlico was already a living, breathing place. In reality, it was an almost indescribable disappointment. The track was a crumbling relic, neglected to the point of decay. It looked as it hadn’t been improved—or inspected—since the War Admiral–Seabiscuit match race in 1938. There is a line that separates quaint from old. Pimlico was far on the wrong side, and remains there. The only thing that has kept Pimlico in business for the ensuing decade-and-a-half is the Preakness. And the Preakness—while a fine and important horse race within the racing industry and in the city of Baltimore—holds elevated relevance to the broader sports world only because it is the second leg of the Triple Crown. The first part of this equation will be changing soon; most of Maryland’s racing takes place at Laurel, a more modern facility 20 miles southeast of Baltimore; there are only 12 racing days this year at Pimlico. Twelve. Officials have reportedly estimated that updating Pimlico would cost $300 million, and that is unlikely to happen. The toe tag has been filled out and handed to the coroner for application. All that remains is for local politicians to find appropriate cover. The Preakness will almost surely move to Laurel, and will endure through growing pains to thrive as a local racing spectacle. Pimlico will fade into history like the Polo Grounds or Chicago Stadium. But what about the second part? What about the Preakness, not as a local celebration, but as a national sporting event? We are in a post-American Pharoah world, where the lengthening Triple Crown drought that reached 37 years before Pharoah’s emotional victory in the 2015 Belmont Stakes was the dominant story line in the sport. And it was a powerful narrative, one that repeatedly brought fans to the brink of history, only to leave them crestfallen. But with each failure, the moment became larger, until Pharoah’s win unleashed nearly four decades’ worth of relief. Just as the drought had been the star of the show when Silver Charm or Smarty Jones or California Chrome fell short, the drought was the star when American Pharoah won. Now the drought is gone. (Credit to Pat Forde of Yahoo Sports for getting there first this week on this angle). The sport arrived in Baltimore this week in need of a story line reboot. Without the drought, the Triple Crown remains a transcendent athletic achievement— it’s been done just 12 times in history—but without the underlying certification of having not been done in a very long time. What American Pharoah did in 2015, many of those in attendance had never witnessed in any form. There is no replicating that moment. And while Seattle Slew (1977) and Affirmed (1978) were seemingly not diminished by Secretariat’s own drought-ending Triple Crown in 1973, the media world then was a much quieter place and racing held a more significant place in that world. Today, every event needs a hook and racing needs a hook more than most. The Preakness might provide that hook. We shall see. The world is a particularly noisy place at the moment, with little room for the quaint. The cardinal rule applies: Only one horse can win the Triple Crown now, and this year, that horse is Always Dreaming, a dominant winner of the Kentucky Derby. Always Dreaming’s Derby win was the story of a shrewd trainer, Todd Pletcher, coaxing a brilliant performance from a colt who had run just once stakes race in his life. As ever, different questions arise two weeks later. Bob Baffert, who trained Pharoah and has won four Derbies and six Preaknesses (and the Derby and Preakness in the same year four times), swears by the credo that when a good horse wins the Derby, that horse should win the Preakness. It’s only two weeks, basically a redo. But Pletcher, whose horses have won more money than any trainer in history, has never won the Preakness (and only two Derbies in 17 years running horses in it). Pletcher succeeds not only through business and equine acumen on a large scale, but through patience and careful matching of horse and race. If a horse isn’t ready today, Pletcher will race him next week. The Triple Crown schedule pushes Pletcher off his spot, a catch-and-shoot player forced to take a dribble. The Preakness often suffers from Derby horses skipping the race and waiting for the Belmont Stakes, or for other races later in the racing season. This year, four other Derby horses, in addition to Always Dreaming, are back, including runner-up Lookin At Lee, Hence, Gunnevera and, the most intriguing, Classic Empire. The Breeders Cup two-year-old champion, Classic Empire struggled with injuries and an unwillingness to train before winning the Arkansas Derby on April 15 and going off as the 7-1 third choice in the Kentucky Derby. He is a tough and formidable athlete. However, Classic Empire’s chances were compromised at the wild start of the 20-horse Derby when Irish War Cry collided with McCraken, who collided hard with Classic Empire. Despite the incident, Classic Empire ran on to a respectable fourth-place finish and surely would have been closer with a clean start. (This rematch led to a Twitter exchange in a which an account registered in the name of Always Dreaming trolled an account quoting Casse). The post position draw added intrigue to the rematch: Always Dreaming is in the No. 4 hole, with Classic Empire outside in No. 5. It’s likely that Classic Empire and jockey Julien Leparoux will try to stalk Always Dreaming and John Velazquez, applying pressure. 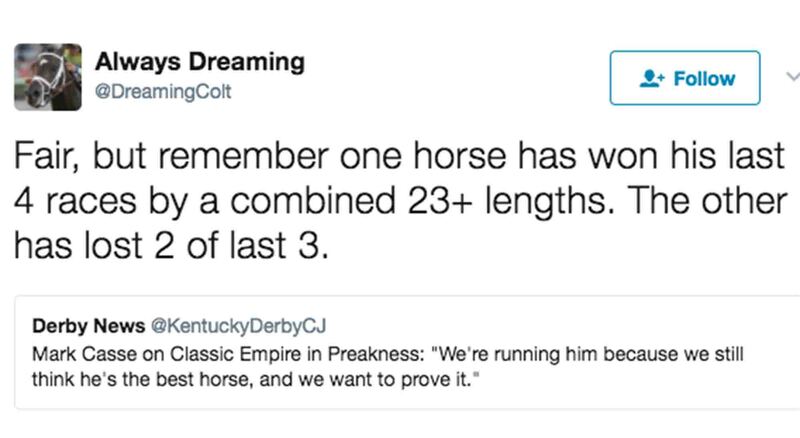 If those jockeys become too competitive, their horses could become tired and set up the race for a fast-closing finisher like Cloud Computing (who skipped the Derby after finishing third in the Wood Memorial), Gunnevera (who ran a lethargic seventh in the Derby) or Lookin At Lee (whose rail-running second in the Derby came at 33-1 odds). Still, the plotline comes back around to Pletcher. Always Dreaming was the best racehorse in the Derby by a wide margin. Pletcher did terrific work in getting Always Dreaming to the Derby after taking over his training last summer and even better work in getting him calmed after a few rambunctious gallops in the morning at Churchill Downs. Always Dreaming has been anxious again this week at Pimlico, which Pletcher has chosen to interpret as a good sign. Pletcher has won two Derbies now. He has already won two Belmonts. The Preakness is a hole on his resume and beyond that, if any trainer could be considered overdue to win something as elusive as the Triple Crown, it would be Pletcher. A victory Saturday by Always Dreaming is the sort of thing that could briefly bring Pimlico to life for one more day.